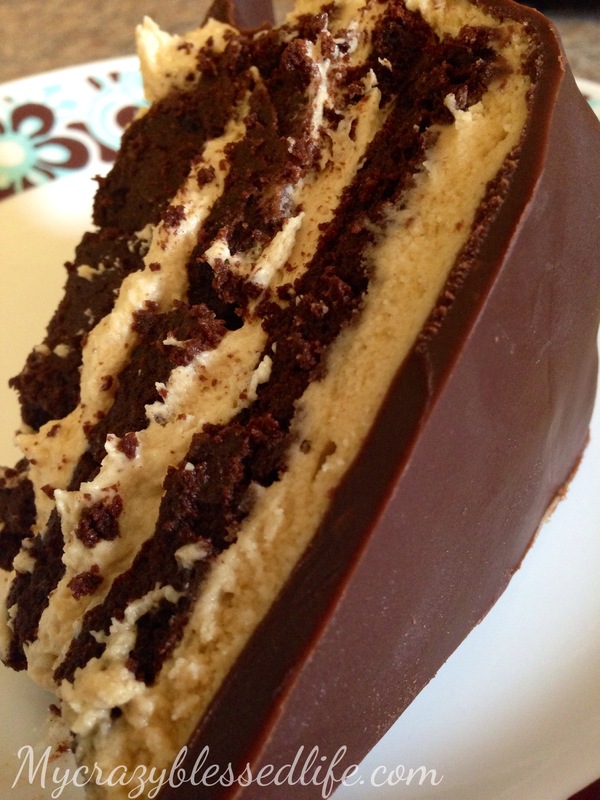 Gluten Free Chocolate Peanut Butter Buckeye Cake | My Crazy Blessed Life! Preheat the oven to 350 degrees and grease three 8″ cake pans or two 10″ torte pans. I like to put parchment paper on the bottom of my pans for easy removal also. First beat the eggs and sugar on high for 4-5 minutes until doubled in size and foamy. While this is beating melt the chocolate chips and butter in the microwave stirring every 30 seconds until melted. Once the egg and sugar mixture is done add the vanilla, salt and cocoa powder. Once everything is thoroughly mixed slowly pour in the melted chocolate while beating. Pour evenly between the prepared cake pans. Bake at 350 degrees for 20 minutes. Cream the butter and peanut butter on high. Add the vanilla and salt and mix well. Add half of the powdered sugar and half of the heavy cream. Stir until blended. Add the other half of the powdered sugar and cream. Mix well and then let sit in the fridge for about 30 minutes before icing the layers. Microwave and stir every 30 seconds until melted. Let sit about 5 minutes before pouring over cold buttercream! After the torte layers have cooled layer them with icing and then pour the ganache over the whole thing. Before taking it to church I needed a photo of a slice and wanted to test it before serving it to others! My kids sacrificed and helped me eat my slice too 🙂 I got rave reviews from home. I hope my gluten free friend loves it too. Thanks for stopping by!